This week was more about planting out than sowing. Here in a sheltered spot in the south, with the help of some warm walls, frosts in May are unusual, and rarely harsh. I am not ready, quite, to risk planting out the winter squash as they are a precious crop, not to mention that the bed is not ready for them yet, but the summer squash – courgettes, conventional and round, and patty pan – were planted out this week. Hopefully there will not be a late frost, but they can be resown if needed. We also planted three ridge cucumbers in one of the glasshouses. They are usually considered an outdoor crop, planted out after the danger of frost has passed, but they have done a little better for us under cover. Last year they scrambled around under the potting benches in the polytunnel, seemingly quite content despite the slightly reduced light levels below the slatted benches. This year, with a shortage of sweet pepper plants following poor germination, we had some spare space in one of the large glasshouses so planted the cucumbers in there. Whether they will be happy under the warmer conditions of the glasshouses remains to be seen. We already have our glasshouse cucumbers planted – the old fashioned Telegraph – so if this little experiment goes awry we will still have plenty of cucumbers. The broad beans, sown in pots a couple of weeks ago, had all germinated and put on some vigorous growth. They were ripe for planting out – sturdy and well developed yet not pot bound. Across our four foot beds we planted three rows of seven plants each. We already had a couple of rows outdoors, as well as some in the polytunnel. This might be our last batch this year, but if we do decide to grow some more they will be sown direct. Finally, we set about making a more long lasting frame to provide some pea supports. Peas were traditionally supported with pea sticks, but these are not so readily available now. Any twiggy wood pruned from garden shrubs can be used, and we have done this in the past. However, this year we had nothing suitable to hand. We have usually bodged up some support with some batten and pea netting. This works reasonably well, but the netting tends to sag and is a fiddle to do each year when there is so much else to do in the garden. So, from some spare lengths of 2” x 2” timber, and an assortment of batten that was lying around, Dad and I put together a frame to support some more robust plastic mesh. The result is quite sturdy and should last many years, moving each year to the next bed in the rotation. Growing any great quantity of peas, especially if one wishes to freeze some for later in the year, requires a lot of space. Instead, we tend to view them as a seasonal treat, eating them fresh from the vines or enjoying with our new potatoes, perhaps combined with broad beans. Nonetheless, a few four foot rows of a good yielding variety will produce a worthwhile crop. 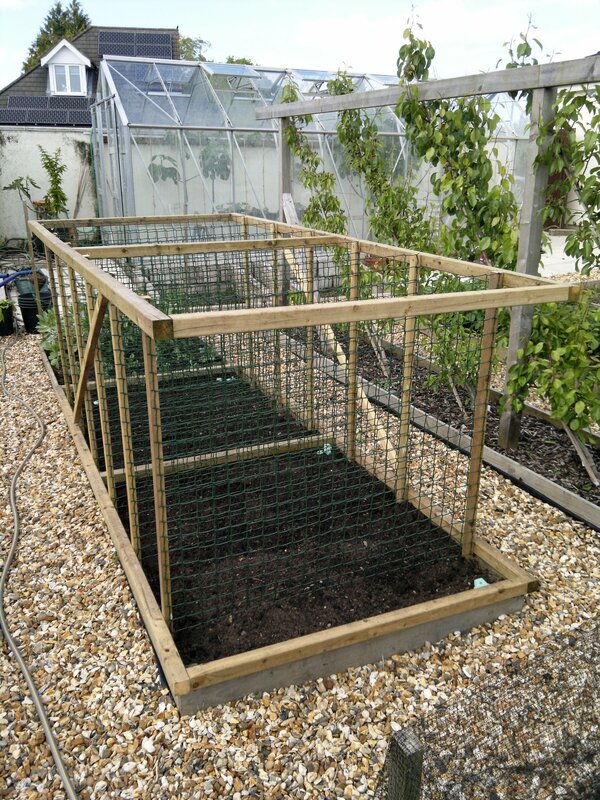 The frame provides six four foot rows, at a spacing of 18”, and is the ideal height for our current favourite pea – Hurst Greenshaft. Sowing double rows, each side of the support mesh, we sowed direct four of Hurst Greenshaft and two of the old mangetout type Carouby de Maussane. The latter might be a little tall for the frame, but we shall see what happens. The construction of the frame did not unduly impede sowing so hopefully it will not interfere too much with harvesting either. To provide further pea supports, I am planning to drive in a few large round posts along the edge of the borders to which more mesh can be stapled. We have two such borders for annual crops. One is used for winter squash and the other for overflow planting from the main beds. They are rotated each year, but the supports will be equally helpful with some of the smaller climbing squash as they will be for the peas – the larger squashes would be too heavy, but the likes of Sweet Dumpling and perhaps even the butternuts should be suitable.